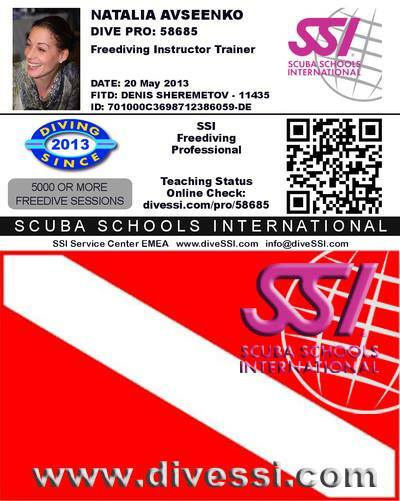 Our congratulations to our team member, our heart and conscience, twice world champion in freediving Natalie Avseenko, who became Freediving Instructor Trainer SSI at 20 May 2013. Great job, Natalie! We are so proud of you! Note: 5000 or more freedive sessions have been done by her, as the card reads. Just imagine, what does it mean! This entry was posted in Uncategorized and tagged Natalie Avseenko by SnowKitty. Bookmark the permalink.